When I was using a DISH VIP722 receiver, I was introduced to the mystical world of diplexers, triplexers, and separators . . .
Basically, all three allow you to simplify satellite TV wiring by using one cable instead of two. That’s it. But the devil’s in the details . 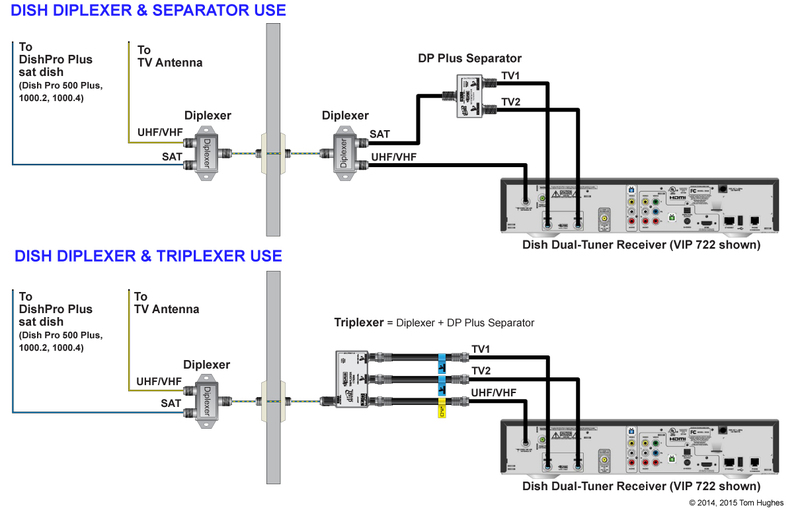 . .
For example, Diplexers are used in pairs: the first Diplexer combines a Satellite signal with an Over-The-Air (VHF/UHF) or a cable TV signal.
. . . a second Diplexer un-combines the VHF/UHF (or cable TV) signals.
. . . a DISH Separator is used with DISH dual-tuner receivers, like the 722.
. . . and a DISH Triplexer is just a Diplexer and a DISH Separator in one. WHAT DOES ALL THIS HAVE TO DO WITH A WINEGARD CARRYOUT G2? Nothing, but that’s the point. Diplexers, Triplexers, and Separators are NOT used with a Winegard G2. If you want to use a dual-tuner DISH receiver like a 722 with a G2, connect it like this . . .
Are there instructions available for setting this up? Do you have to set the 722 to SW64 and run a check switch?